the sweet or the savory. and the everything in between. this week marks a year since his passing. oh gpa would love this dish! gpa loved him some spice and salt. my memories of him are about food. as it was something gma would expressly forbid him from having. *note: this is inauthentic, in that i did not deep-fry the shrimp. click on the link if you want to make it the “correct” way. i broiled them super quick in the oven. to keep the shrimp on the side of under-done, i worked quickly, make sure your mise-en-place is done accordingly. **note: also, this dish is best with head on but the local Whole Foods doesn’t carry it. asian markets will carry head on prawns, but it’s not guaranteed organic and/or sustainably caught. ***note: this is a finger food, meant to be consumed in a group, with ice-cold beers and plenty of napkins. which is why, dw and i ate with a side of carrot+celery salad and brown rice, with chopsticks. first, preheat oven to highest it’ll go, broil or in my case, 550F. next, prep everything and have all the ingredients ready to go. clean/devein the shrimp. there were some shrimps that lost their shell because i was a little indelicate but it was a price i was willing to pay to not eat poop. wandering chopsticks has a pic tutorial you can refer to. pat dry the shrimp. dry roast the salt, ground pepper and 5 spice powder. (NOTE: you will not be using ALL of the blend in this recipe). set aside to cool. when cool, mix in the sugar. line a shallow cookie sheet with foil or parchment paper. if using foil, oil it. 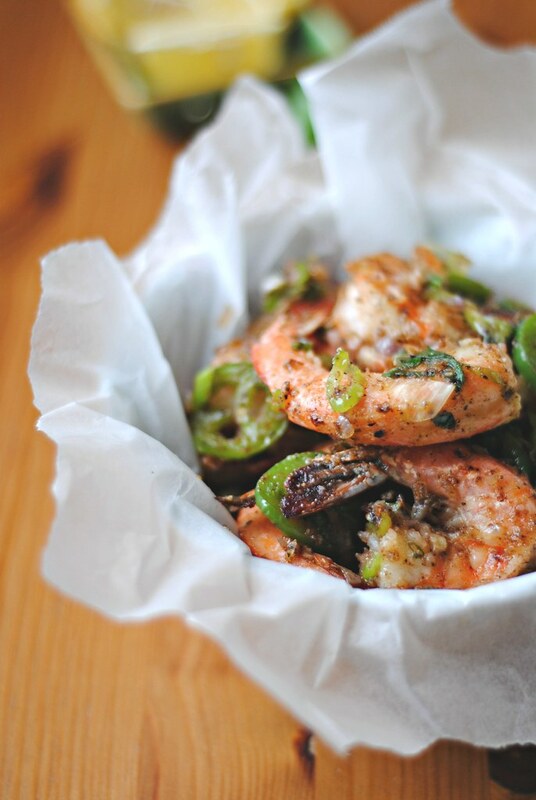 dust the shrimp with potato or corn starch. or you can do it my lazy way, holding by the tail, dip the shrimp into the starch and shake semi-vigorously to let loose excess powder. lay on the prepared sheet. broil in oven for TWO MINUTES. meanwhile, in a frying pan, heat up a drizzle of oil on medium high. saute the garlic, onion, green scallions and jalapeno. you’re aiming for fragrance, not so much burning or caramelization. this can be anywhere from 3-5 minutes. which means, in the middle of this sauteing you’re doing, you need to take the shrimp out of the oven. make haste. set aside the shrimp. when the onions and garlic have softened, add in the shrimp. WORK QUICKLY. 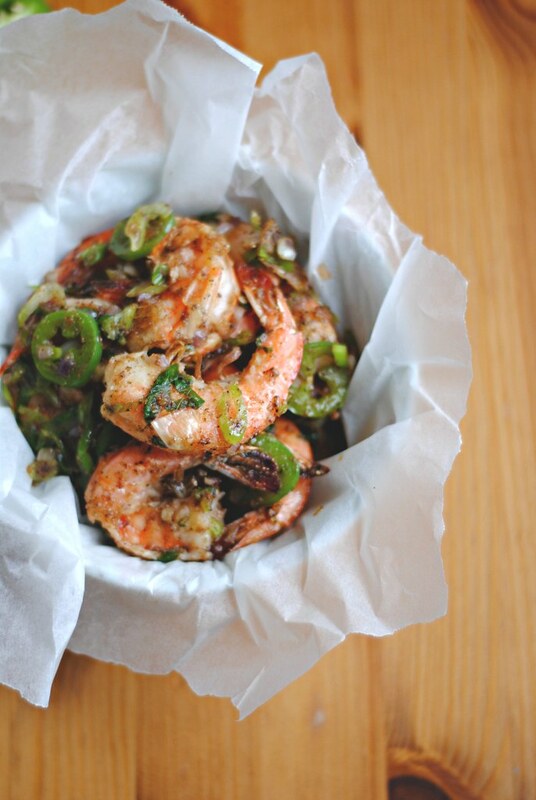 sprinkle the shrimp with a few teaspoons of the salt/sugar/pepper/five spice mixture. (i ended up using 3 teaspoons, season to your taste). gently mix everything, heating the shrimp through. REMOVE from heat. this step should take 2 minutes, 3 minutes TOPS. the end result should be on the dry side, unless you’re like me and gpa and got a little generous with the drizzle of oil. Awww such a cute story. Thank you for sharing the story of your gpa and this dish. I like the idea of eating with fingers and beer but also the idea of this with chopsticks and rice. Cholesterol is a funny thing. The myths around it shift every every few years. They say now days that seafood and eggs don’t affect cholesterol in our blood if we eat them. I bet your gpa would be happy to know that. thanks genie. there ‘s always some kind of varying viewpoints on what is good vs what isn’t. everything in moderation! you are kind Jenn, thank you. Such a sweet tribute to your grandfather. I’m sure he would have loved this! And your photos are beautiful, too. chaya, thank you so much. This is a perfect summer dish. I can’t wait to make it…and to honor your gpa when we enjoy it. wendi, let me know how it goes! thanks sophie. the peppers really gives the dish a kick. thank you amanda. it’s so amazing just how much our g-parents shaped us, isn’t it? Aw, what sweet memories of your gpa. Your gpa sounds a lot like my gpa. He ate without apology and lived to 95. 🙂 I’m sure he would have love these shrimp, (the fried version). 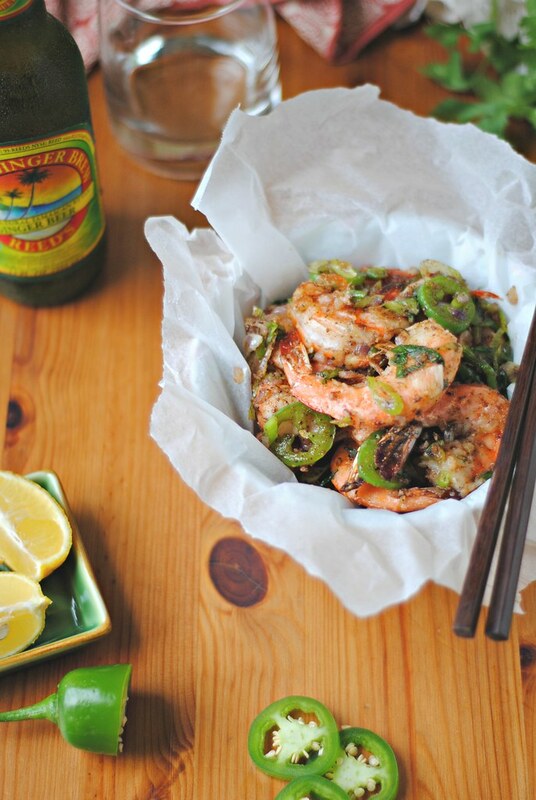 The next time I find some good looking shrimp I’ll definitely be making this. Thanks for sharing Lan! oh gawd, i love the fried version too! and next time i’m at a true authentic vietnamese restaurant, i will order it. until then, i gotta do the broiled version. This (and spicy salt and pepper squid) are two of my favourite things to eat. Drooling. Some of my best food memories involve my grandparents: they teach us so much around the table. yes to spicy salt & pepper squid! and i agree, grandparents provide such a different, but equally good, education around the table. I love this tribute to your grandpa. So beautiful. 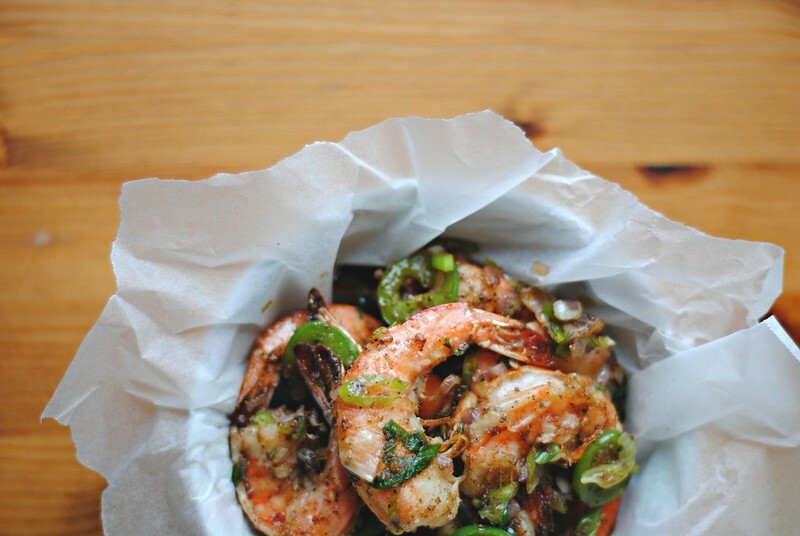 And these shrimp — holy crap. They look amazing. I love that they’re broiled instead of fried — I want to try this ASAP! dw also loves that i broiled this instead of fried, because the kitchen would’ve been a WRECK. plus, i should not be trusted around frying oil. Hi Lan, your grandfather sounds very special, sounds like you have wonderful ,memories of him. Have a great week-end! hi Cheri — thank you, i do have such great memories with him. Thanks for sharing. 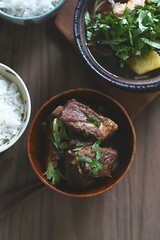 This is one of my favorite dishes but I’ve always been scared to make it.